July 12, 2016 by Grace L.
I'm obsessed with this little beauty! It looks so delicate but it's sturdy and strong. I get a ton of compliments already and will be back to Kathy Kuo when I'm ready to order more- they were so nice! March 21, 2015 by sarah k.
This piece is the perfect entry way table for my New York apt! The marble is beautiful, and the gold legs are sophisticated and slender. 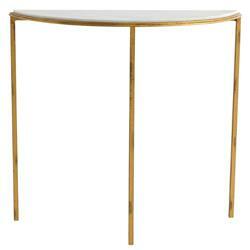 Add a touch of Hollywood glamour with this gorgeous gold and white marble console table. The slim, half-circle table fits discreetly against the wall in an entry or hallway. This piece creates the perfect place for a floral arrangement or collectible display. The delicate design of the distressed iron frame combines romantic and industrial styles for an eclectic element in any space.